Event - Coffee Bean & Tea Leaf's "Trade Up Your Cup"
Cruising through the morning haze on the 57 North, I glanced briefly to my left and had to do a double take. It was not too long after the advertised "gates open" time of 6AM on September 29, 2013 that we found ourselves on the freeway heading in the direction of Angel Stadium and yet, the mass of people we could see standing in the parking lot down below was visible from our moving vehicle's vantage point. I suppose that just as marathon runners must train before the big 26.2, deal hunters must train for the impending Black Friday season; how else better to do so than to score one of 2,500 lucky spots in line for a brand-spankin'-new Coffee Bean and Tea Leaf CBTL® Americano Machine (retail value: $149.95)? 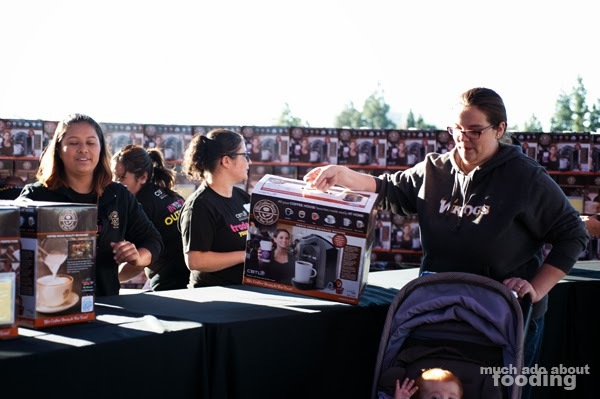 If you were one of the first 250, you could also snag a free CBTL® Milk Frother (retail value: $49.99). 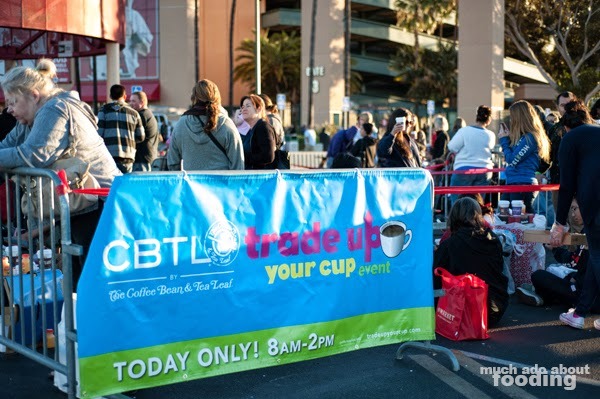 In celebration of National Coffee Day, The Coffee Bean and Tea Leaf ran their 2nd Annual "Trade Up Your Cup" event which gave coffee fans the opportunity to trade in an old electric coffeemaker for a brand new CBTL Single Serve Beverage System. 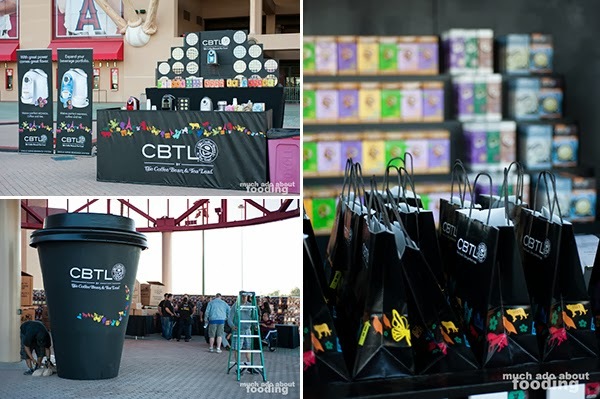 All those in attendance also had the additional savings opportunity of purchasing (3) 16-packs of CBTL® espresso and coffee capsules for $20, a price discounted more than CBTL employees receive. No wonder the lines were long! 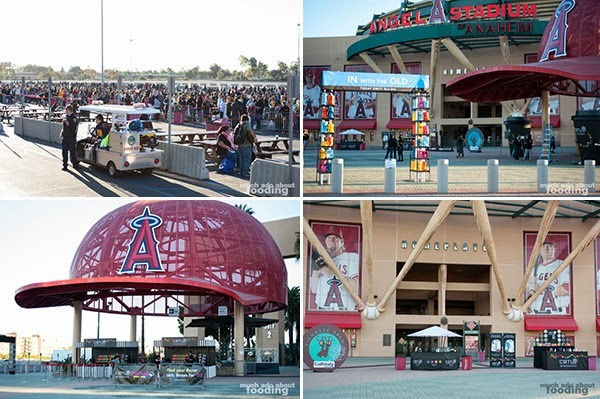 Unfortunately for those who did not rise early and head to the event (gates opened at 6AM, exchanges started at 8AM), enough Orange County dealmongers sped to the stadium to cause cars to be turned away from entering at 6:30AM. This was a stark difference, according to CBTL staff, from last year's event which was held on Sunset Boulevard in Hollywood (with a different machine being the "prize"). 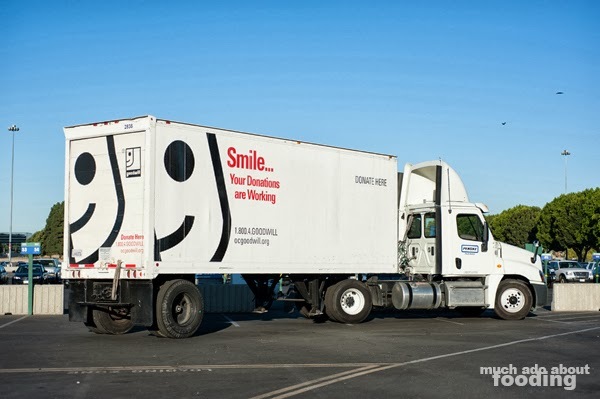 "We saw a few people just walking across the lot from what looked to be across the street. The apartments around here I think.""No. Running. There were people RUNNING to get here, jogging with their clunky machines.""Nice." Location, location, location. We always hear about how important that is for anything, and for an event with expected attendance of more than 2,500 people, there had to be a suitable area for the crowds. 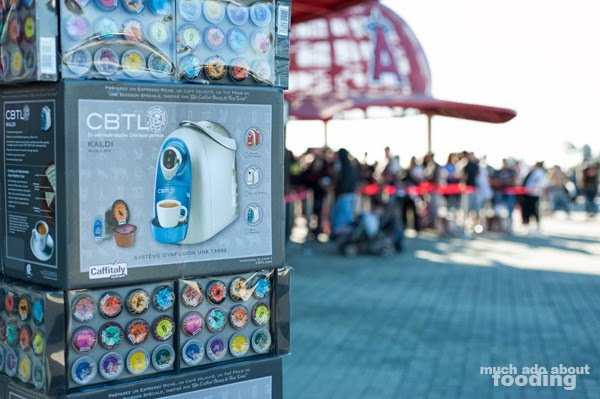 We spoke with Mark Bunim, District Manager, about the choice of Angel Stadium for this event and for CBTL, it seemed the obvious choice. 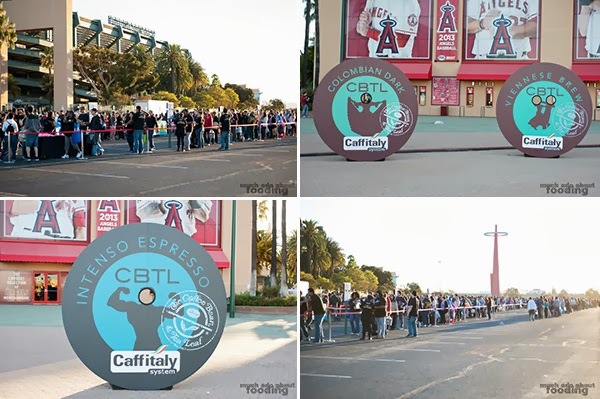 The two businesses already have a strong relationship with one another, even allowing for CBTL to do capsule tastings during a recent game to demonstrate the Americano's might and spread the word about Trade Up Your Cup. It is also an iconic and central location for Orange County, Los Angeles, AND San Diego (all from which attendees admitted to coming that early in the day). Then of course, the issue of parking was covered by the vast lot the stadium owned. It was a spot well-equipped for hordes. The word is that there will most likely be another similar event next year though the exact location, he could disclose. Darn. We have our guesses though. Inland Empire anyone? The buzz of excitement from all of those waiting in line was nearly tangible as we walked around, watching their 70-80 person volunteer & CBTL staff rush out to attendees with free coffee, water, orange juice, and pastries. You wouldn't want a large crowd like that to be hungry and eventually angry right? 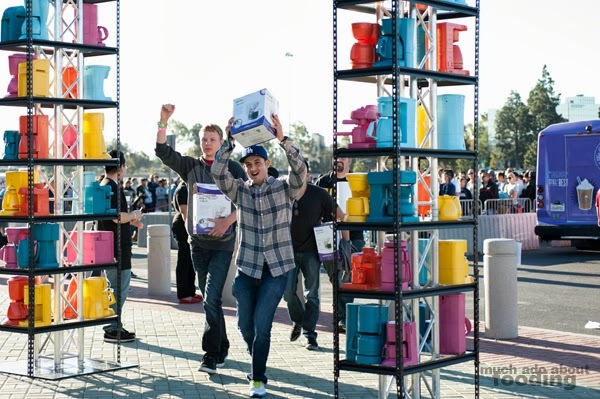 Wristbands were handed out to ensure everyone's spot for a coffeemaker as well. 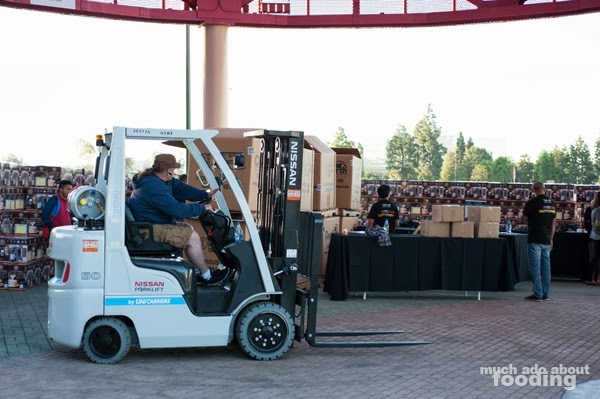 From what we heard, there were several overzealous guests who had claimed their early spots by arriving at 3AM in the morning (to put that into perspective, the staff and set-up crew only started arriving at 4:30AM). Orange County loves its free stuff. We've got to hand it to them - the marketing and publicity was good. 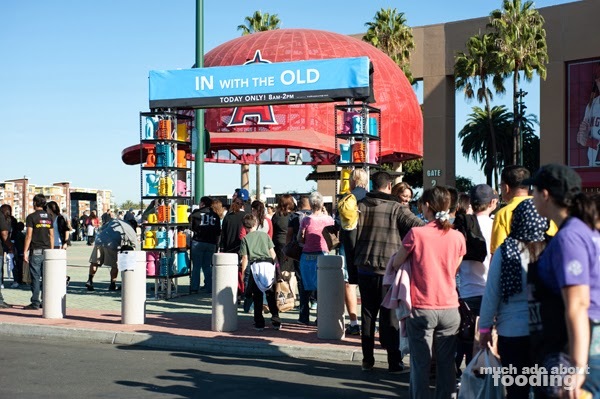 In addition to the demonstration at Angel Stadium a few days prior, other methods of marketing for this well-attended event included partnering with local businesses and restaurants, doing capsule demos, and getting news out via press releases and media outreach. 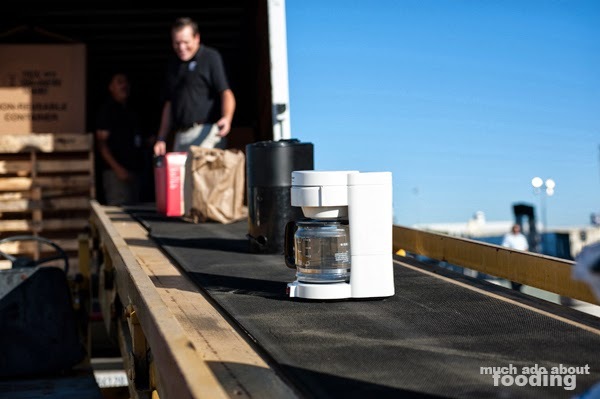 If you're wondering where the coffeemakers were going, Goodwill had trucks at the ready to transport these old appliances to new homes. They were the recipient of the coffeemakers last year and brought their crew once more to another CBTL event. 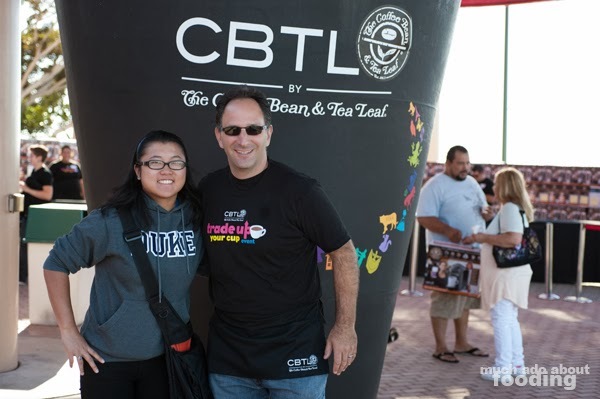 It was no surprise that there was a charitable aspect to this event as CBTL often gives back to the community either through local non-profits or national organizations as often demonstrated by their seasonal specials ($1 winter drinks for charity anyone?). 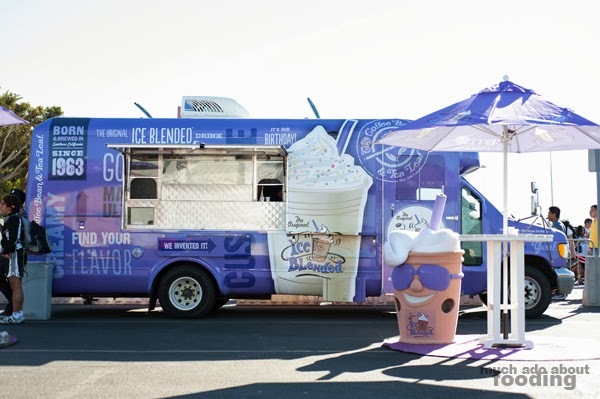 For activities, there were silly cutouts, CBTL "Connect Four," and even the Ice Blended drink truck (did you even know they had one?) giving out samples. Though at first glance, it seemed like many were there for the freebies, we started to understand that most were just fans of Coffee Bean and Tea Leaf. Mark noted how enthusiastic everyone was and how much they voiced their own love for the brand before and after the event. It was a rallying of loyal customers, and the mouth marketing that brought their friends and them together. This promotion was also a way of bringing future fans into the community - the machines work only with their own branded capsules after all! When the line was finally able to break free and start the trading, it went a lot calmer than expected. 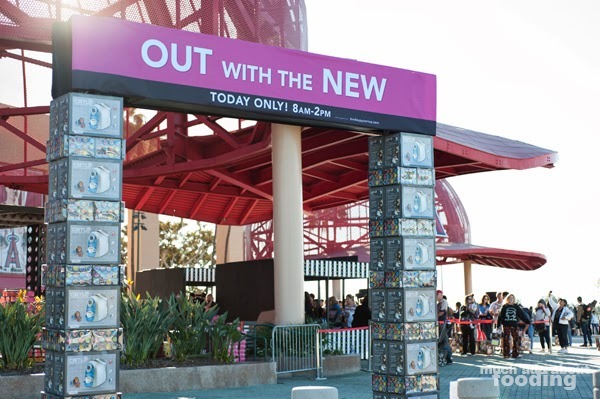 Our hats off to the volunteer staff who kept their cool and enforced the five-at-a-time policy of letting attendees through the "In with the Old" archway (a complementary "Out with the New" arch stood on the opposite side of the trade zone). Jumping and cheering commenced as one by one, happy CBTL fans came through with their now-retired machines, grabbed a redemption card for the next station, and got their hefty boxes of convenient caffeine. We had an enjoyable time watching others make their trades and left before those leaving would overwhelm the parking lot exit. Our thanks to the crew that notified us of the event and to Mark Bunim for giving us a few moments of his time. As with any large scale event, there looked to be hiccups due to volume (people getting turned away) but overall, it seemed certainly a buzzworthy event.